The first figure shows how British uniform had developed over the winter of 1914/15. Wearing the softer Officer issue cap this Officer is wearing privately purchased rubber boots and his own scarf. Of interest is his rifle. It is a Jefferey Farquharson sporting rifle (commonly referred to as an elephant gun) which was capable of firing a .600 nitro round. These rifles were brought in by officers to help combat enemy snipers, who by this point of the war had developed novel methods of concealment, including armoured shooting holes. This rifle was capable of piercing armour and was used to great effect on the Western Front. The second figure designed to compliment the first figure, shows a casual depiction of a British NCO reflects the cold, damp conditions found in trench systems across France and Belgium. Wearing the soft Gor Blimey cap and an animal skin (goat or sheep) jacked (known as a stinker) this ‘Tommy’ is full of character. The Royal Welsh Fusiliers are one of the British army’s oldest regiments, and despite the name in 1914 over 25% of the 2nd Bn were recruited in Birmingham (England). In action from early on in the war, the Regiment were on the front over the 1914 Christmas truce and in the area of Ploegsteert through the winter of 1914/15. The two figures are posed on Diorama trench, Ploegsteert Wood 1915. 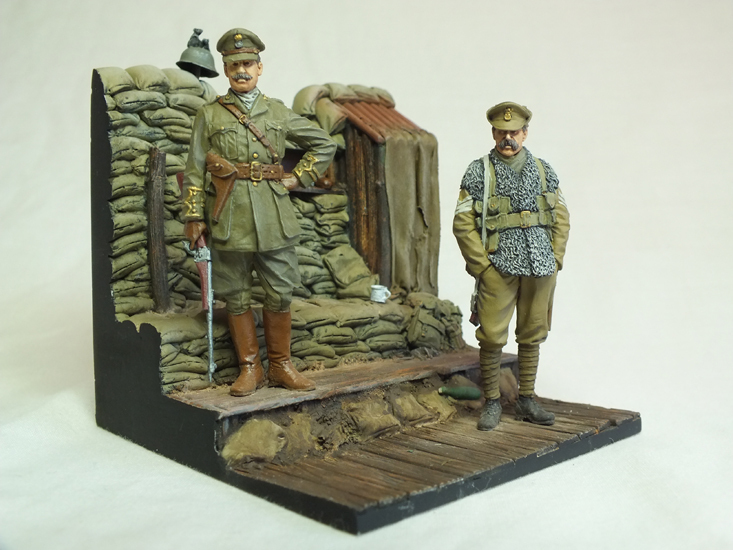 This trench section comes in 2 resin parts and creates a diorama base 80mm x 80mm x 120mm high. With base comes a number of accessories to create an early war (pre-1916) trench including a German Pickelhaube or a late war version (post 1916) including a German and British steel helmet.